According to the latest bathroom trends report from the National Kitchen & Bath Association (NKBA), designers feel that the shower and vanity categories hold the most interesting new product options. The report, which surveyed more than 500 kitchen and bath designers and other industry experts, found that 20 percent of respondents believe new offerings in showers and shower surrounds were some of the most interesting products on the market. Seventeen percent were intrigued by vanity choices, and 10 percent preferred new bathroom technology products. In showers, designers pointed out solid-surface walls, touch controls, curbless and no-door designs, wet rooms, and architectural shower doors as growing standouts in the category. For vanities, respondents were excited about floating cabinets; new finishes and colors; new materials such as MDF, recycled material, laminates; high-gloss looks; and open shelves. Noteworthy technology solutions included controls for lighting, music, water temperature, and leak detection; mirrors with built-in TV, lighting, and steam control, app-enabled control over radiant floors or digital shower valves; and color therapy for showers and bathtubs. 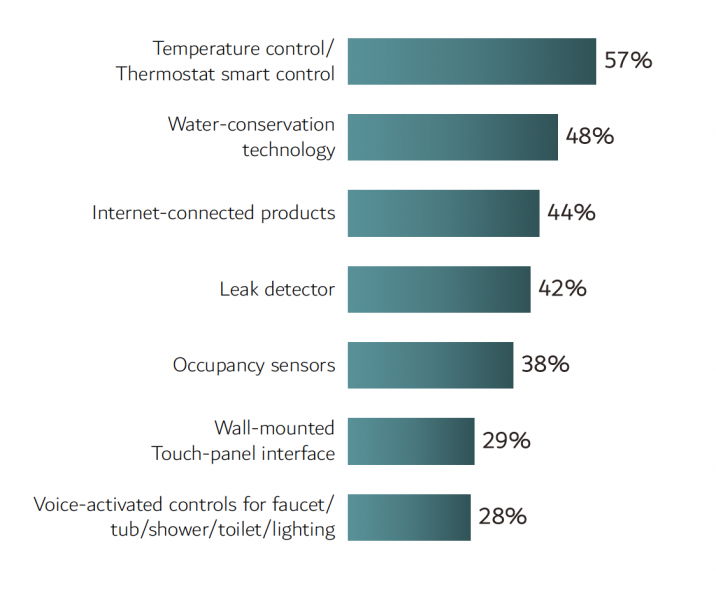 Respondents also expect smart temperature control to be the fastest growing bathroom technology segment over the next three years (57 percent), followed by water conservation technology (48 percent) and Internet-connected products (44 percent). Survey respondents also identified the product categories that need the most innovation. Complaints were strongest for hardware (18 percent) and sinks (15 percent). Respondents requested more integrated grab bars, toilet paper holders, and decorative towel bars; more finish options for linear drains and residential safety products like grab bars; and a greater selection of ventilation products with heat. In sinks they wanted to see new materials, shapes, and installation innovations, as well as updates for material and style of undermount sinks. Despite the excitement around new vanities, the category also disappointed some respondents, with 14 percent indicating that the category needed innovation. Respondents requested better solutions for smaller areas; storage for jewelry, hair products, and other essentials; more style, color options, and materials; and more attractive and waterproof wood looks. In overall bathroom style, transitional and contemporary looks are expected to dominate over the next three years. Eighty-three percent of respondents expect transitional style to remain popular, and 79 percent agree that contemporary will do the same. 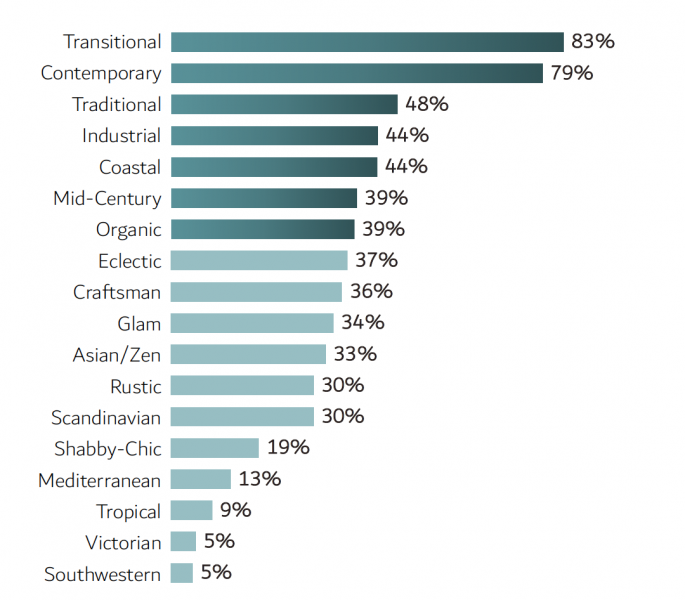 Only 48 percent of respondents say traditional style will maintain popularity, putting it at a similar level of more niche styles like industrial (44 percent) and coastal (44 percent), which have been growing in popularity. Key design elements popular in transitional baths are whites and grays; heated, large-format plank flooring; recessed panel doors; marble countertops; hex or arabesque tiles; and large lighting fixtures. Contemporary bath design hinges on the use of minimal, clean colors, stained concrete floors, floating vanities, integrated sinks, and smart faucets and lighting.